We have done many sets of waiting room chairs. Our turnaround time is very quick and we normally reupholster the chairs in manageable portions so as not to empty the room and have no chairs on hand. Commercial upholstery needs to hold up and last under heavy use. Fabric selection and internal padding make all the difference. New Life Furniture can thoroughly assess all the materials being used in a commercial setting. Office chairs that are showing signs of wear need not be discarded. We can revive worn and stained office chairs by reupholstering them and duplicating their original look. Task chairs that are showing signs of wear need not be discarded. We can revive worn and stained office chairs by reupholstering them and duplicating their original look. New Life Furniture has reupholstered many different styles of exam chairs, exam tables, and stools. We can change the upholstery color or duplicate the original color with our extensive selection of hospital rated vinyl. We can reupholster the worn section of a split exam table. Reupholstering conference room chairs can change the whole look of the conference room. A new color or different pattern can really make a statements. We can upgrade the comfort in the process too. Auditorium seats rarely get reupholstered all at once. 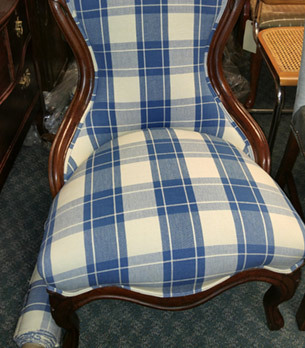 We can reupholster worn or damaged ones and match the upholstery quite closely to match the other seats. We are very adept at reupholstering church pews. Our foam and fabric selection are top of the line for durability. Quick turnaround time is always our goal. We can custom design and make up any thickness and size outdoor cushions. New Life Furniture can duplicate existing cushions that are worn out and sun-faded or make cushions for areas that never had them. New Life Furniture has an extensive selection of outdoor fabrics to choose from. We can help you select the perfect fabric for your project. The difference between indoor foam and outdoor foam is that indoor foam is closed cell structure and outdoor foam is open cell. Open cell foam allows the water to pass right through it. By allowing the water to drain quickly through the cushion the likelihood of mildew and mold forming on the fabric and in the cushion is drastically reduced. Antique furniture predates the advent of foam and other man-made fibers and stuffing. Upholstered furniture was double stuffed: seats and backs were built up with horse hair, cotton, and burlap that were hand stitched to make up a mattress type of seat or back structure. At New Life Furniture we can restore your antique upholstery as it was done originally. New Life Furniture can custom build a sofa, loveseat, club chair, or ottoman for you. We have custom built upholstered furniture to fit specific needs. We build our pieces to last many generations, the way pieces were built originally. New Life Furniture can remake replacement seat and back cushion cores. If you’re sinking in too far on the sofa or chair, a firmer seat cushion core could be just the cure. We can make up the cushions with varying firmness to suit your comfort. Achieve the perfect look for your home or business with upholstery services and commercial upholstery repair from New Life Furniture Systems in Wilmington, Delaware. We provide the services you need for a better looking home or business. Our professionals will upholster furniture pieces for your home or business. We can build a piece to match your current furniture. Our craftsmen offer superior workmanship and exceptional customer service. We will professionally repair or update any modern or antique furniture upholstery. We have access to hundreds of fabrics, including leather and vinyl. Upholstered furniture made prior to 1890 would have used hand tied spring, horse hair and cotton to build up the seat or back underneath the upholstery. This type of furniture should be reupholstered the way it was originally intended. To retrofit foam and manmade materials or a different spring system will increase the longevity of the piece and would be money well spent. At New Life Furniture, we have the ability to reupholster pieces just as they were done originally to provide a period accurate restoration. Upholstery techniques changed over the different style and time periods and it is important to faithfully rebuild the innards as they were meant to be. Contact us in Wilmington, Delaware, to add aesthetic appeal to your home with our upholstery services and furniture repair.